This story was updated at 11:38 p.m. ET. A Russian Soyuz rocket blasted off today (July 14) carrying new residents for the International Space Station, a trio of veteran spaceflyers representing Russia, the United States and Japan. 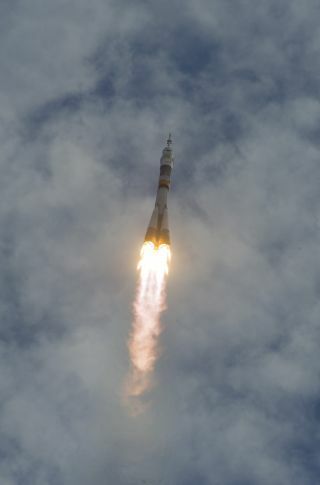 The rocket launched the Soyuz TMA-05M spacecraft from the Baikonur Cosmodrome in Kazakhstan at 10:40 p.m. EDT (0240 July 15 GMT), though it was early Sunday local time at the Central Asian spaceport. Onboard were an American, a Russian and a Japanese astronaut due to take up residence for four months at the orbiting outpost. The Soyuz soared smoothly into a blue sky dotted with clouds, punching a hole a one cloud layer as it launched into orbit, according to a NASA broadcast. It is due to dock at the station early Tuesday (July 17), where the three newcomers will join the existing crew of three on the space station's Expedition 32 mission. The new complement includes NASA astronaut Sunita Williams, Russian cosmonaut Yuri Malenchenko, and Japan Aerospace Exploration Agency spaceflyer Akihiko Hoshide. By coincidence, the U.S.-Russian-Japanese crew's launch and docking is coinciding with the 37th anniversary of the world's first international space mission in history: the Apollo-Soyuz Test Project. On July 15, 1975, NASA launched an Apollo capsule as the former Soviet Union launched the Soyuz 19 capsule to perform the first international space docking test. The mission set the foundation for the international partnerships that have led to the $100 billion International Space Station in orbit today. In September, the current station crew —Gennady Padalka and Sergei Revin of Russia, and NASA astronaut Joe Acaba — will return to Earth, and Williams will relieve Padalka as space station commander. She will be the second female space station commander in the facility's history. "I'm not good at bossing people around — but my husband might say that's not so true," Williams joked. "If I say we're going to do this, they all jump on it. Everybody's also felt free to offer their two cents. I think it's going to be really, honestly, pretty easy, and part of that is communication." The international crew will each be bringing a taste of home and their own cultures with them to share. "I'm not a very good cook, but fortunately we have a couple of Japanese foods that I'm bringing up, so I'd like to share that with my fellow crewmates during my stay," Hoshide told SPACE.com. "Just sharing stories, talking to each other provides a great base of international cooperation." The Expedition 32 mission will be chock full of activities, between space station maintenance, visiting robotic cargo spacecraft, spacewalks (extravehicular activities, or EVAs), and a full load of science experiments. "That's a whole lot of work the crew has to do to do the berthings, the dockings and the EVAs," said Mike Suffredini, International Space Station Program manager. "In addition we will allocate 35 hours per week to research." Several visiting unmanned spacecraft are expected to deliver supplies to the space station during Expedition 32. One of those space freighters, a Japanese HTV-2 cargo ship, is slated to launch in just six days, NASA officials said. There is at least one Russian spacewalk planned during the crew's stay, and possibly an American-led one as well. "To do an EVA, this is always something special; I can compare it to docking a vehicle to station, and going outside, it's something unusual," Malenchenko said. "So we are looking forward to do this." And Williams, Malenchenko, and Hoshide may also be in space to see the first official cargo delivery by a private spacecraft, if commercial firm SpaceX (Space Exploration Technologies) launches its first Dragon supply-delivery run while they're there. Dragon flew a test mission to the space station in May, and is now prepping to launch the first of 12 delivery flights the company is contracted for over the coming years. "Getting the commercial sector involved, I think it's a good thing," Hoshide said. "It opens up new doors. I'm looking forward to that very much."